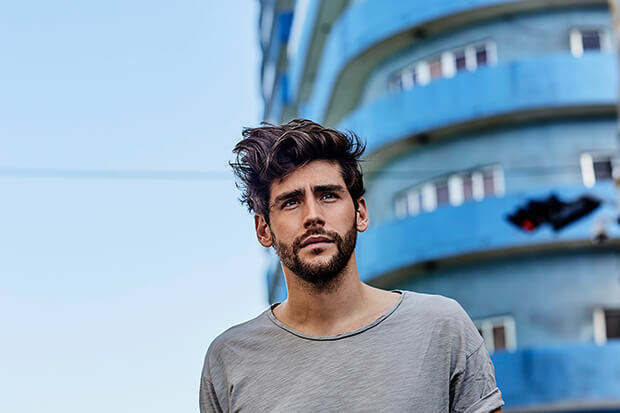 Alvaro Soler broke big in 2015 when “El Mismo Sol” became a surprise smash. (It even got a remix featuring Jennifer Lopez). The German-Spanish singer backed it up with more hits including the still-catchy “Sofia,” but nothing could prepare him for the worldwide success of “La Cintura.” The humble, relatable banger about overcoming two left feet conquered the charts across Europe, racking up more than 140 million streams on Spotify. With those kind of numbers, it was only a matter of time before the lucrative US and Latin American markets started to pay close attention. The feel-good anthem recently got an overhaul featuring Flo Rida and TINI, which proved to be an instant success with the tropical video soaring past 20 million views in a matter of weeks. 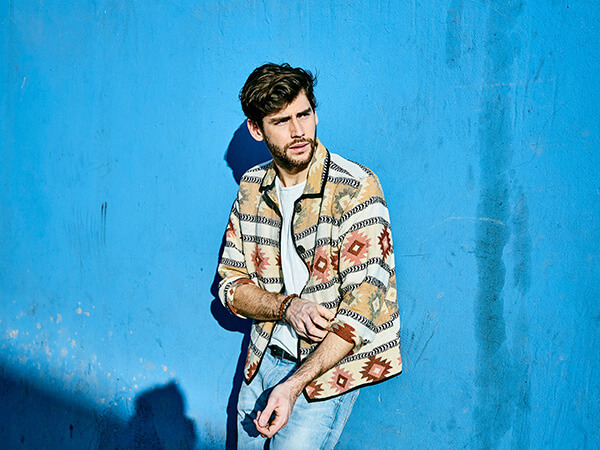 Alvaro’s sophomore LP, Mar De Colores, arrived on Friday (September 7) and it shows that “La Cintura” is just the tip of the iceberg. There are other instantly addictive floorfillers, sultry slow jams and even a dreamy piano ballad. I recently spoke with the 27-year-old about his breakout hit as well his eclectic album. Get to know the rising star a little better in our Q&A below. When you first recorded “La Cintura” did you know you had a hit on your hands? But even so, I think the expectations were much lower than what actually happened in the end. They just told me five minutes ago that the song has been number one at radio for 10 weeks. It was also a big hit in countries outside Spain, which has been an incredible surprise. So no, we didn’t exactly know all of this, but we had a feeling. We just didn’t know it would be this big. It’s such a catchy song. From what I understand, it’s about your bad dance moves? Yes. It all was born through the word, “La Cintura,” which is the title of the song. When I sang the melody, I don’t know why I sang that word. It was the first thing I sang, and sometimes, there’s this thing that happens that the word perfectly matches the melody and there is no other word that you could ever use to make it sound as good. And I thought, “Oh man, the word fits so well in the chorus, but I can’t use it because I’m not a dancer,” so I can’t sing a song that talks about my hips. So I thought maybe I could use this opportunity and talk about my hips in a different way, by confidently saying that I can’t dance and that it’s fine. And it’s cool to open up and not care about what other people say when you’re dancing, because that was my deepest problem. I always thought, “I’m not going to dance because of what people might say.” So why bother? It shouldn’t be like that because dancing is just an expression of your happiness. If you’re not dancing, I think you’re missing out on something really big. I’m happy that through the song and through the video shoot, I got more confidence in myself as well. I went through some kind of a psychological test. It was like self-therapy. I thought your dancing was pretty good in the video! Well thank you, I had a lot of training. The remix featuring Flo Rida and TINI is starting to get played in America. How did it come about? I think that came about through our friends at Interscope. We sent the song to Flo Rida and he liked it and said he wanted to record a verse for it, so we were super happy. Then, we were waiting on his vocals, and TINI came on board because we wanted to include an artist from Latin America as well. It was great to have both of them on the track. Sometimes with features, you have a feeling they want to do it and then the next day maybe they don’t. I was very calm, because I didn’t want to get excited in case it didn’t work out. I also think the version with Flo Rida is cool because everyone on the track has their own unique style and they all blend together on the song, which makes it a really fun listen. Did you get to hang out with Flo Rida on the video shoot? Yes, we did. Nowadays videos can be made without the other artist being there and I think that’s a pity. So we tried to make it work. We recorded the scenes with TINI in Madrid and we got to hang out during filming. The next day, I flew to Miami to meet Flo Rida and film there. I love that TINI is so natural because chemistry is important. I hate it when it feels forced, but that wasn’t the case at all. With Flo Rida, we met in Miami and we had two scenes — one on the island and then the one at night. We didn’t have the chance to talk so much, but we hung out between takes and we got to chat. It was pretty cool. I’m so glad that I worked with people I could have a normal conversation with, He’s a cool guy. Spanish-language pop music is having such a big moment in America with songs like “Despacito” and “Mi Gente.” Does that inspire you? Of course. It gave us the chance to say, “It’s kind of opening up over there, so we should take every available opportunity.” The goal for every artist is to make the music accessible to as many people as possible, so reaching out and collaborating with other people from other nationalities is just very cool. I think it’s great that America embraced Latin music because it’s such a big market. It’s nice that Spanish-speaking artists now have the chance to show what we’re doing and share it with more people. Do you have a theory as to why Latin music is crossing over more regularly? I think it’s just how music works. Different genres become more popular all of a sudden. Like the way EDM exploded and is now a staple of pop music. It’s in fashion somehow. It’s trendy now, but let’s see if it’s permanent. That would be nice. And it’s all music, and in the end that’s an international language — if we’re singing in Spanish or English. I also think it has something to do with dancing. Latin music is easier to listen to than say German music because Latin music is usually combined with dancing. I think if it’s a danceable song then you have a much better chance of cracking the American market, more so than if it’s a ballad. I think that’s because the lyrics are more important in a ballad than an uptempo song. The musicality of the song is easier to access for people who don’t speak the language. Also, “Despacito” played a big role. Justin Bieber singing on that song opened the door, and then everyone just started to feel brave enough to do it as well. What are your plans for the US? Is there going to be a proper rollout or are you just playing it by ear? I think we’re doing a little bit of both. I’m releasing my second album in September, so I still have a lot of work to do here in Europe. Then, in October, we have a trip planned to Los Angeles. I’m going to the Latin American Music Awards. Normally, I would use the opportunity to do some promotion while I’m there. I don’t have any plans yet, but I’ve been to L.A. and Miami a few times. I would love to do some promo on American radio stations and stuff like that. Let’s see if we can combine it. I like a balance. I don’t usually have a rule about features. I think it depends on the song. Right now I’m working on a song, I just recorded the vocals ten minutes ago, and I think it needs a feature. But I’m not afraid to release it by myself, you know. We’re always in such a hurry, which makes it tricky if you want to get a feature on it. But it just depends on the moment, and if everything works out, collaborating is very cool and helps you expand your audience. So from that perspective it’s very nice. Tell me about Mar de Colores. Is “La Cintura” reflective of the sound? It’s going to be a bit of everything. My first album was really successful in Europe, which was kind of a surprise. I didn’t have a fan base or anything, so I started from scratch on. Now, I have an identity when I go in the studio and I’m more confident at experimenting with new sounds. I will try a country idea or a blues idea and just see what happens. I think a lot of cool things have come from this. Musically, it’s a very cool ride. You can expect a lot of variety, because I always want to record an album that I would like to hear myself. So there are songs in the mold of “La Cintura,” but it also has some slow songs as well. There’s also a ballad, there’s a lot of different things. Actually, the ballad is one of my favorite songs on the album. The piano was my first instrument, but I started to play guitar when I moved to Berlin. My family said, “Hey Alvaro, you should do a song on the keys,” because they would always hear it when I was practicing. They liked it and they missed it. I thought, “Why don’t I do it because I also miss the piano.” So I sat down at the keys. I’m very curious to see what people think of the album. I think it still has the Alvaro Soler identity, but I really mixed it up. Do you intend to release any English or Spanglish songs in the future? I’ve done it in the past with the J.Lo version of “El Mismo Sol.” We did a Spanglish version and a full Spanish version. I’ve done before, so I don’t feel unfamiliar with it. I would do it if it made sense. And English would be the first language I would sing in apart from Spanish. People in Germany sometimes ask me about singing in German and I tell them I’m not interested. But English feels natural to me. Why not, you know? I’m not opposed to it. Thank you for your the chat. Good luck with the album! How did you discover Alvaro’s music? Let us know below, or by hitting us up on Facebook and Twitter!